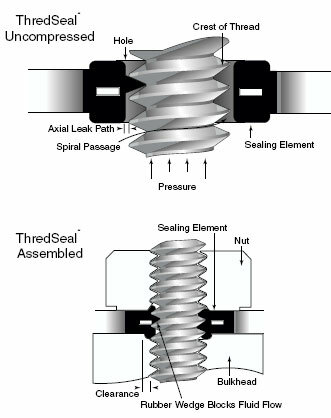 Thread seals have been designed to seal the threads of machine screws, studs, and similar items. They are made in one piece, the rubber sealing element being molded into the metal retainer. They utilize the principle of controlled confinement of the elastomer, permitting metal-to-metal contact of faying surfaces. Most fluid systems have fasteners that must be sealed. Parker’s fastener seal designs found in the Stat-O-Seals® and Thread Seals® feature an elastomeric sealing element molded in place within a metal retainer (washer). Although resembling a simple o-ring groove concept, the mold in place fastener seal offers numerous advantages. Ideal for sealing small and miniature sizes, the Parker Lock-OSeal ® is a two-piece combination seal comprising a separately molded o-ring fitted within a surrounding metal washer. Other speciality fastener seals are also available.